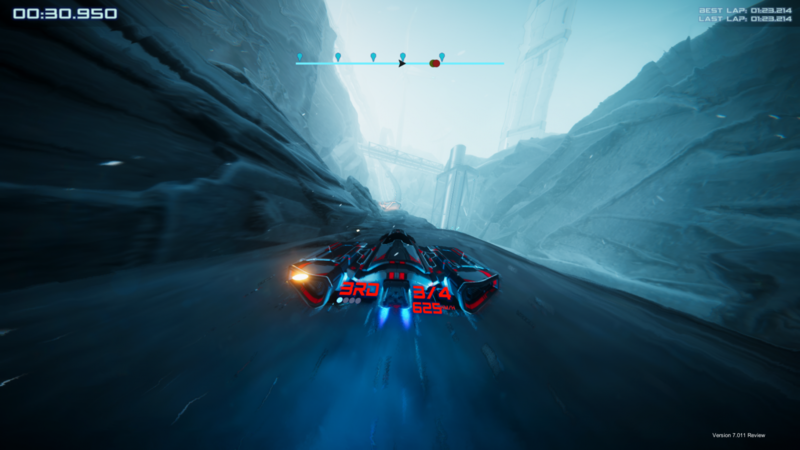 Antigraviator Review — The Speed's There, Where's the Content? Antigraviator Review — The Speed’s There, Where’s the Content? Race six is over, and I’m shaking from the caffeine fix I needed in order keep up with this game. My eyes sting from the sheer concentration of trying to process the rapidly approaching bends, and I’m sure my finger is exhausted. 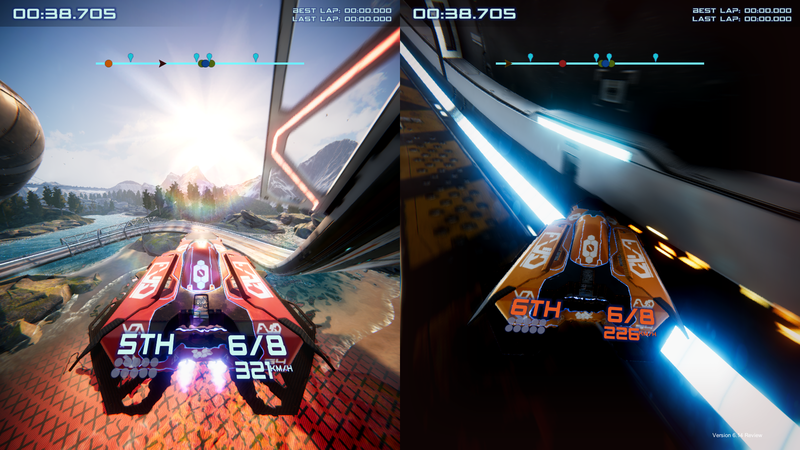 Antigraviator is a fast-paced, intense racer that feeds you the track so fast that you’ll be leaning in to fight against the digital g-forces. In 2210, developer Cybernetic Walrus seems to believe that ridiculously speedy vehicles known as Gravs and are capable of reaching over 500kmph exist. These hovering vehicles are designed to take part in the Antigraviator tournament which put high-speed Grav’s against one another. They’ll be racing through twists, twirls, and jumps among a variety of tracks in different locations. 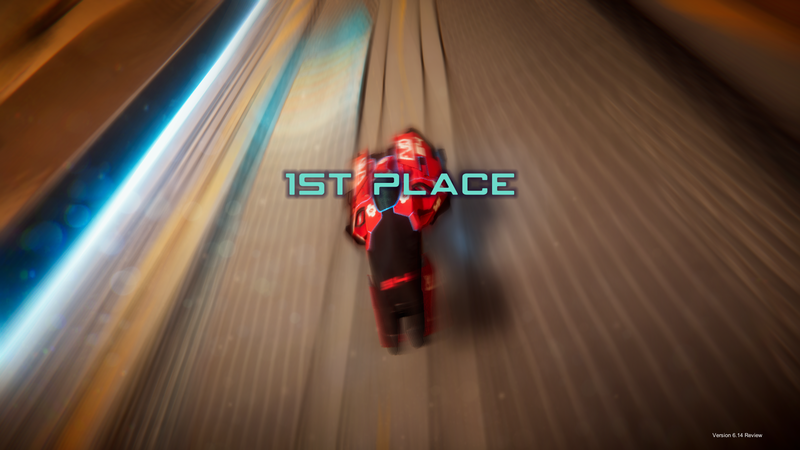 If I had to explain what Antigraviator was like short form, I’d say that the title takes the arcade presence of WipeOut and injects the modern reimagining of speed from RedOut. 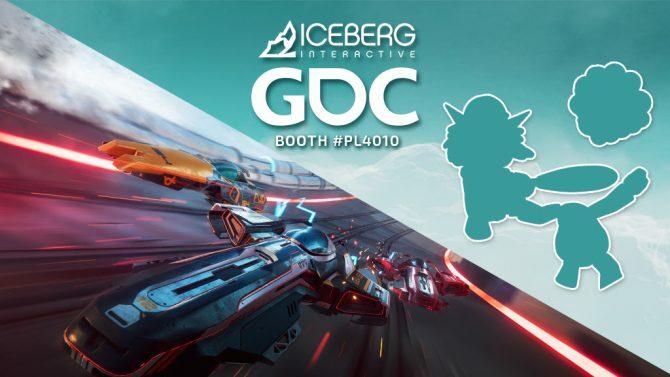 After learning the ropes through the tutorial, you’ll get to decide on running through the campaign mode, racing online, or going against bots or a friend in split-screen. The campaign is the central area of the game that’s populated with eight leagues to compete in, with each league hosting four tracks. Players unlock leagues by performing well in the previous one. Once opened a league will cost you an entry fee. In-game money is earned by completing leagues and can be spent on new Grav’s or new parts. It’s a bit of a shame that this is the only way to earn money though as sometimes sitting through four races can be a tedious task. The different modes available include: Deathrace, which is a last man standing scenario; Countdown which finds Grav’s racing through checkpoints or face elimination; and Single which is the standard lap race we all know and love. The racing itself is excellent. The speed is undoubtedly present, and it requires skill to not smash against the wall and damaging your hull and getting faced with a pulsating vignette. It’s one of those games that lets you relax when you know you’re ahead, but if you’re behind you’re pressing buttons in further than they should go. Along the shiny world of Antigraviator, clumsily barrel rolling into other racers isn’t the only way to turn the tides of the race into your favor. Players will collect traps and activate them with a simple button press. A green hue glazes over your shield to indicate a successful hit. There are fifteen of these traps available through the game. A map is shown as a straight line with dots to signify racers confusingly, while pins mean traps that players have placed. It’s a bit confusing, but that doesn’t really matter as it doesn’t get used. The bottom line is you’re too busy focusing on navigating. In fact, I don’t really know why Antigraviator even implements a HUD because you spend more time looking ahead of yourself rather than at the information around you. If you do crash from trying to focus on the HUD, then don’t expect to be amazed. Considering you’re traveling at speeds faster than the JR-Maglev, you’d expect a collision to be greeted with explosions. Instead, you sort of… puff out of existence? 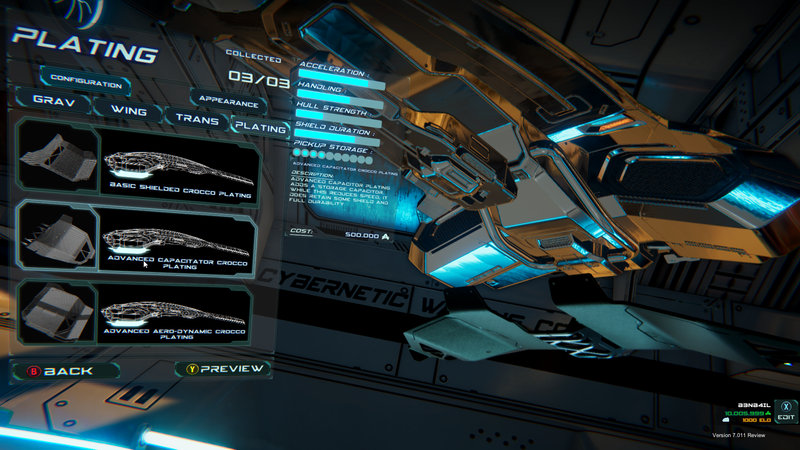 Developer Cybernetic Walrus is really missing the mark by not adding action-packed explosions. When you do get to a point where you can afford to buy parts you’ll end up a bit disheartened to know there’s not much variety in the Hangar area. I certainly was. I did, however, enjoy having to make choices based on how it affected my vehicle, such as speed, boost pickup amounts, and hull strength. It just feels a bit lacking considering the hard grind to earn money in the first place. 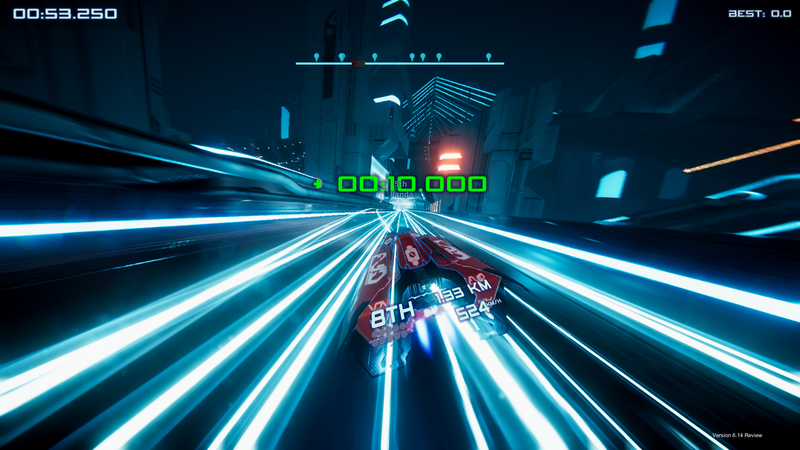 Antigraviator looks sleek and feels smooth to play along tracks with more glows than TRON. While it seems remarkably similar to RedOut, it does maintain an arcade personality, mainly through its classic looking menus. Although saying that, the menu does look a bit ugly and feels like selected elements could be more prominent. Perhaps a brighter glow, or buttons that elevate out. The visuals give you an excellent illustration of speed, but the soundtrack is another factor that really gets you on edge. Head pounding tracks with heavy bass serves as musician motivation, using the catchy rhythms to urge you to do one more race. Sadly this feeling can be broken up by the announcer voice-overs that feel like someone found the fun filters in an audio editor. Thankfully, the campaign has enough leagues to keep the game going for a while, and the split-screen mode for offline races let you get a friend involved. I’m not sure on how well Antigraviator works online as the servers weren’t populated when I was reviewing it. More Gravs to choose from and more parts to unlock would undoubtedly give the game a longer lifespan. It is enjoyable to play but doesn’t really venture outside of what has been done before, and the lack of cosmetics makes me worry that they kind of… ran out of ideas. But you can expect to enjoy Antigraviator for the rush of adrenaline alone. 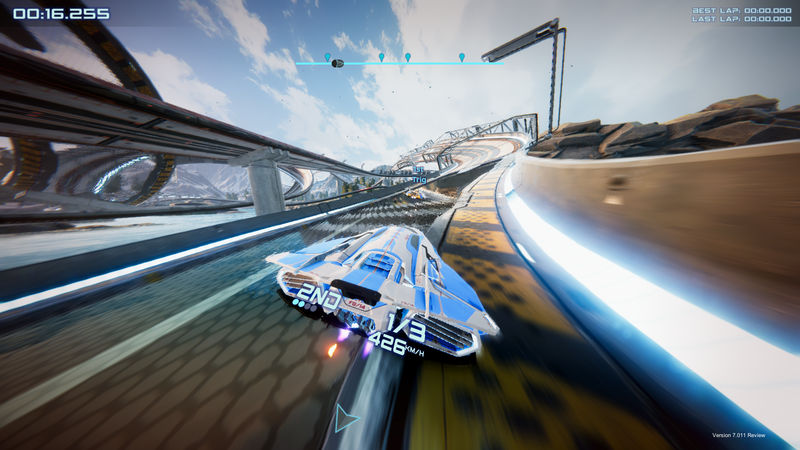 Antigraviator is a futuristic racing game that is reminiscent of F-Zero and WipEout, but still captures the great sense of speed the genre is known for.